I own four pairs of these pants. They look good, they're durable, comfortable, versatile, water repellent and the construction is top notch. The belt is integrated into the pants and functions as expected with no slippage. 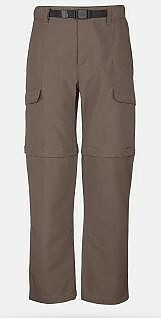 The pants have a DWR finish which works great on hikes where one might encounter dew and other light precipitation. I have been on hikes during brief thunderstorms and the pants have done well. Eventually, the DWR can only repel so much and they eventually wet through, but, they dry quickly. The lower legs of the pants have zippers which means you don't have to remove your boots when the pants are converted into shorts. I have used these pants hiking and backpacking in canyonlands to mountain peaks in temperatures from the 20s to the 90s. The fit of the pants is roomy in the seat and legs. Pockets: there are cargo pockets on the thigh which are secured by velcro and next to the right hip pocket is a zippered pocket which comes in handy for storing things you don't want to lose, like car keys. These are good pants for the money. 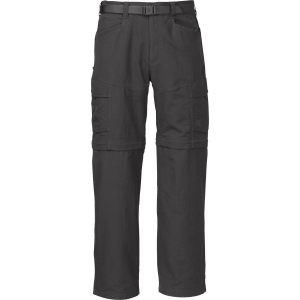 The North Face Paramount Peak has been a great convertible pant. One reason I bought these in the first place is that they fit well. I am a 32"x34". The medium waist, long length is true to that size. Also, when the legs are zipped off, the shorts are not too short. That is my main complaint with most convertible pants. They fall right above the knee. Fit is a very personal thing, though. Pockets are functional and placed well. One zippered pocket keeps the important ID cards secure. Cargo pockets are good for maps. I also really like the integral belt. Since it is built in, it does not extend to the back of the pants, and does not interfere with a backpack. The material is very durable. I have been through thorns, thickets, and sliding on the ground without even a snag. The DWR treatment has held up well in drizzle. However, the material is a bit heavy and gets warm in summer. I suppose that is the tradeoff for durability. These wick well and are not heavy or saturated after a day of summer backpacking. I will say this: I liked these pants enough that I purchased a second pair. Very lightweight, and appears to be well made. These were the only pants that fit my frame at the sporting goods store, and they also just happened to be the most expensive! The speed at which they dry is remarkable, I was truly shocked and duly impressed. I will give a long term review later, but for a week's worth of daily use, they are doing just fine...so far. Still going strong. These are the best hiking pants I have ever used. A teensy bit thin on the seat, but the seams are 100%, and the leg zippers are perfect. Great product. The North Face's Paramount Peak Pant is great for both everyday wear as well as in extremely demanding outdoor situations. The product's versatility and design thus make it suitable for everything from casual activities to backpacking, climbing, kayaking, and more. The North Face Paramount Peak Pant for men are my go-to pants for any situation. The overall fit is superb, largely due to the elastic waist, and full seat and thigh area which allows for a full range of movement. 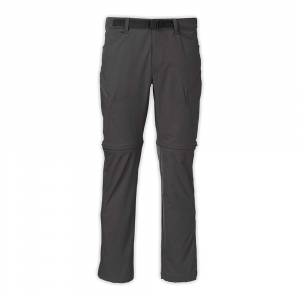 Out of all of the pant options typically available in the outdoor industry, these are the best I've found for those with an athletic body type that need amble space in the quad and hamstring area. 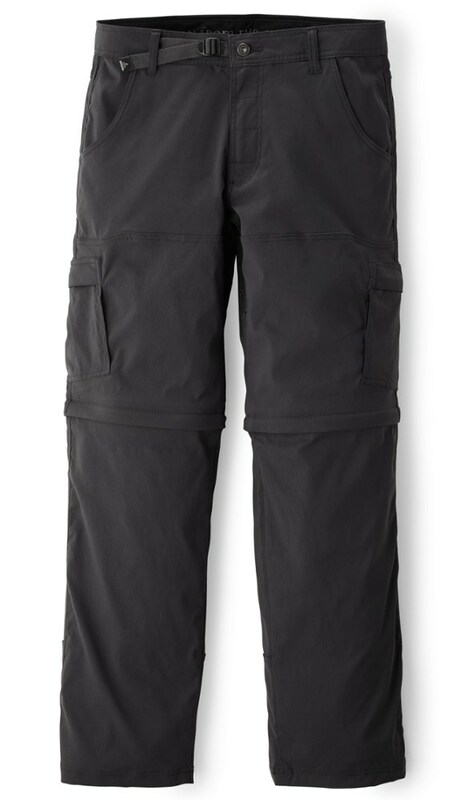 The only drawback that seems to be across the board with The North Face pants is the odd inseam sizing that seems to leave out anyone looking for a 32-33" length. You're either left with pants that are too short at 31" or too long at 33 1/2". 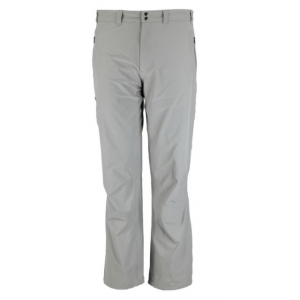 The adjustability is particularly convenient with the integrated belt system that allows for tightening of the elastic waist as well as the zippered leg bottoms that allows for removal of pants or zip-off legs while wearing footwear. Though these pants don't necessarily claim to be water repellent, I have found them to be great at causing water to bead up on the surface. Only after long downpours do they seem to get saturated. After 12 hours of sightseeing in downtown London during a constant downpour recently, I stayed relatively comfortable due to the pant's ability to counter the rain. Additionally, the adjustability of the pant has allowed for the comfortable wear of cold weather leggings underneath. The convertable zippers are easy to use and color-coded to ensure legs return to their original place. The shorts seem to manage a good balance of being the right length for extended walking, but not too short to be more appropriate for the lady-folk. I own three pairs of these pants in various colors and after two years of use, they are as good as new. Highly recommend, especially if you can pick up on an end-of-season sale or with other discounted pricing options. 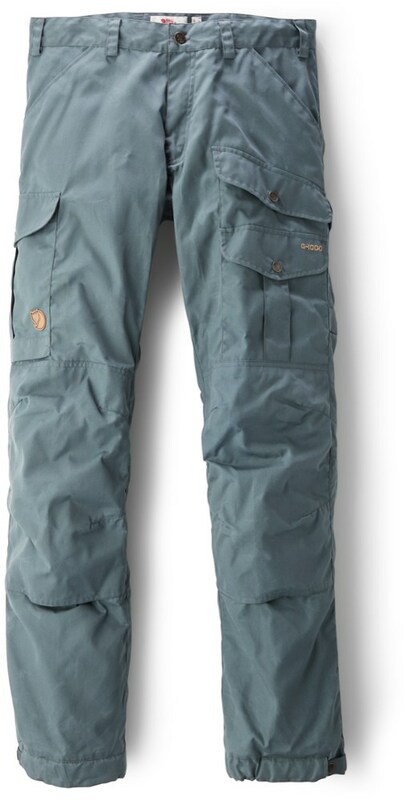 I currently own two pairs of these pants and they are staples in my backpacking and camping arsenal. I have worn them literally hundreds of times and they still look new! Great quality as is expected from any North Face product. Packs down for easy backpack stowing. When I set off for South America and Patagonia I knew I would need a great pair of pants for any condition. After reading the reviews and trying on several of the top brands I settled on two pairs of The North Face Paramount Peak Convertible Pants. Arriving in Chile in July was a RUDE awakening for a kid from the Great Lakes Region! The weather was near zero and while most Americans were grilling hamburgers and hot dogs, watching firework displays I was trying to figure out how I was going to survive a Patagonia winter for two weeks. I broke out these pants and wore them regularly. They did an outstanding job shielding high winds and frigid temperatures. I cannot overstate how comfortable these pants are ascending and descending mountainous terrain. While not waterproof, they definitely held up to the snow and rain better than any other convertible pant that I have worn. Dry equals WARM when you are on the move and North Face has done a great job ensuring these pants will work in all kinds of weather. The one drawback I have experienced with these pants is the adjustable belt on the waist. To be honest it is practically useless. It tends to bind under the fabric and once worn and washed multiple times it almost becomes useless. However, I will buy more of these pants in the future for the long lasting comfort and versatility that they offer. Great pants! 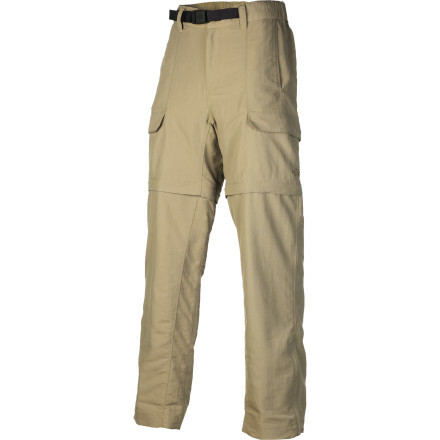 I ordered two pairs of these pants as I wanted the versatility of having pants and shorts without having to pack both. They are extremely comfortable and the area where the zippers are at to convert them to shorts caused no rubbing at all! Great pants! 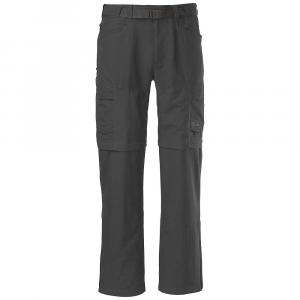 I ordered two pairs of these pants for a hiking trip as I wanted the versatility of having pants and shorts without having to pack both in my pack. I am a tall female and ordered the men's as often time women's pants are too short for me. As a result, when I wear them as shorts they are a bit long for me, but I don't consider that to be a major issue. They are extremely comfortable and the area where the zippers are at to convert them to shorts caused no rubbing at all! The durability is fantastic and they really held up well under the stress of various rough terrain that required some sliding on rocky areas. There are a good number of pockets that were helpful for storing things on the trail. I liked that the back pockets have flaps over them with hook and loop closure. I did feel like the belt could have a closure that is a bit heavier duty. I felt the price was quite reasonable for the excellent quality. I bought these summer 2011 and I've been pretty happy with them for my hikes and even a trip to Mexico. I find the pant to be quite roomy and nice fitting but that being said they can be slightly long in the leg. There are lots of velcro and zip pockets to keep stuff organized and dry. I like that the convertible pants have color coordinated zippers too help you know which pant leg goes where. I find the pants not too bad for noise while walking. I walked in a nasty downpour that only someone in the Northwest could understand and these pants repelled the rain pretty well, it was right along the top of the knees where the rain started too penetrate in where the pants flexed while I walked stretching the fibers. These were my first pair of outdoor pants and I've been quite pleased.